Anthurium sagawae Croat, sp. nov. TYPE: Panama. Panama: Cerro Jefe, ca. 800 m (collected originally by Kamemoto and Sagawa and cultivated at the University of Hawaii and at the Missouri Botancial Garden), Kamemoto & Sagawa 251 (MO 2815436-37, holotype; K, PMA, isotypes; Live at MO). Planta epiphytica; cataphyllum persistens fibris tenuibus; petiolus acute triangulatus, camplanatus ad anguste profundeque sulcatus adaxiale, 21-28 cm longus; lamina subcoriacea, oblanceolato-elliptica ad elliptica, basi acuta ad leviter attenuata, 29-43 cm longa, 11.5-16 cm lata; pagina inferiore rubiginosa, glanduloso-punctata; inflorcscentia effusa ad pendula; pedunculus 4-5 costatus, 40-47 cm longus; spatha pallide viridis, linearo-lanceolata, 5-15 cm longa, 5-15 mm lata; spadix flavovirens, 10-25 cm longus; baccae atropurpu-reae, obovoideae, 6.8-7 mm longae. Epiphyte; stems sometimes branching, to 30 cm long, ca. 2 cm diam. ; leaf scars 1.6 cm wide; roots pale green, 3-5 mm diam., directed upward from upper part of stem; cataphylls 4-5 cm long, acute and apiculate at apex, drying brown, weathering into fine, persistent fibers. 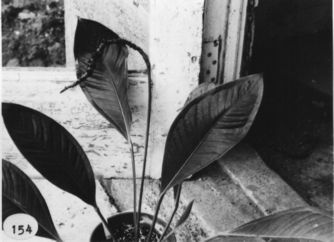 LEAVES erect-spreading; petioles sharply 3-sided, flattened to narrowly and deeply sulcate adaxially, sharply 1 -ribbed abaxially, the sides convex, 21 -28 cm long, 6-7 mm wide; geniculum 1.5-2 cm long, shaped like petiole; blades subcoriaceous, oblanceolate-elliptic to elliptic, abruptly acuminate at apex (the acumen flat), acute to weakly attenuate at base, 29-43 cm long, 11.5-16 cm wide, broadest at about middle; upper surface semiglossy, lower surface much paler, sparsely dark reddish brown, glandular-punctate; midrib convexly raised above, narrowing toward apex, sunken at apex, acutely raised below; primary lateral veins 8-12 per side, departing midrib at ca. 50° angle, more or less straight to collective vein, sunken above, raised below; lesser veins scarcely visible; collective vein arising from the base, 6-15 mm from the margin, prominently loop-connecting the primary lateral veins, sunken above, raised below. INFLORESCENCE spreading to pendent, equalling or longer than leaves; peduncle 40-47 cm long, 3-5 mm diam., 4-5-ribbcd, appearing twisted, 1.5 times longer than petioles; spathe pale green (B & K Yellow-green 6/7.5), linear-lanceolate, 5-15 cm long, 5-15 mm wide, broadest just above base, acuminate at apex, rounded at base, twisted, soon withering; spadix yellow-green (B & K Yellow-green 6/7.5), 10-25 cm long, 4-6 mm diam. near base, 3-4 mm diam. near apex; flowers rhombic, 3.5-4 mm in both directions, 3-4 flowers visible in the principal spiral, 4-5 visible in the alternate spiral, tepals semiglossy; lateral tepals 2-2.1 mm wide, the inner margins broadly rounded; pistils weakly emergent, green; stigmas whitish with droplet for ca. 10 days before stamens emerge; stamens emerging in a prompt, regular sequence beginning at base, the laterals followed rapidly by alternates, the full complement persisting briefly then retracting; anthers white, ca. 0.6 mm long, 0.8 mm wide; pollen white. INFRUCTESCENCE pendent, the spadix to 32 cm long; berries violet purple (B & K Purple 3/7.5), obovoid, weakly emarginate at apex, 6.8-7 mm long, 5-6.5 mm diam. ; mesocarp juicy with few, white raphide cells; seeds 2 or 3, creamy white, weakly flattened, 2.5-3 mm long, 1.5-2 mm wide, 1.4-1.5 mm thick, narrowly rounded at base, oblique at apex with a short sticky appendage. Figs. 153 and 154. Anthurium sagawae is apparently endemic to Panama and was collected in premontane rain forest at 800 m. The type collection was made by Kamemoto and Sagawa on Cerro Jefe. At that time Cerro Jefe was relatively undisturbed unlike the present where little natural vegetation remains. Live collections exist at the University of Hawaii and the Missouri Botanical Garden. It has not been seen since the original collection. The species is in section Porphyrochitonium and is distinguished by its long petiolate, coriaceous, elliptic, punctate leaves with a sharply an-gulate midrib below, its sharply three-sided petiole with a narrow, deep sulcus, and by its long, slender spadix and dark violet purple berries, which are more or less emarginate at the apex with the style sunken in a pit-like depression. 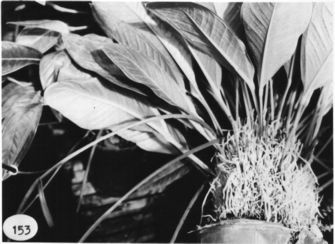 The species appears to be at least distantly related to Anthurium crassiradix with which it shares relatively elongate spadices and similar berries that are usually truncate at the apex with a circular depression. The latter differs in having generally much smaller blades, usually broadest near the base and often rounded or even sub-cordate at the base. Panama: Cerro Jefe, Kamemoto & Sagawa 251 (K, MO, PMA), Sheffer 149, 248 (MO).